Veggie Fest in Naperville is this weekend, Saturday, August 13th and Sunday, August 14th. The event is held on the grounds of the Science of Spirituality Meditation Center just north of the intersection of Naperville and Warrenville roads. This is not a stuffy festival that is dead-set on converting anyone to vegetarianism, but it is a great way to spend some time with family and friends while learning more about the benefits of a vegetarian lifestyle. 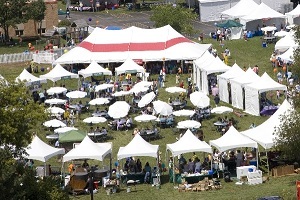 The festival grounds are easily accessible from the northbound lane of Naperville Road (just north of Warrenville Road). Be on the lookout for the Veggie Fest signs that will direct you to plenty of free, onsite parking. The festival runs from 11Am to 8PM on both Saturday and Sunday this weekend. There is some rain in the forecast for Saturday, but Sunday is set to be a beautiful day! I highly recommend you check out Veggie Fest in Naperville.